Fresh, creative activities using a parachute will put the focus on large motor skills. Exciting new routines set to diverse music and original songs address mobility, fitness, directionality, body identification, imaginative play, and important educational concepts. 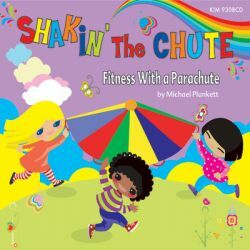 Parachute play can be used for circle time, arrival and departure activities, recess, PE, and indoor/outdoor play. Kids love the exercise, dancing and sing-along fun! Popcorn Parachute, Parachute Bop, Little Parachute, Parachute Freeze and more!